I first met Bob in April of 2003. My friend Randy and I were shooting a local event in Miamisburg, Ohio. Randy and I were “regulars” there, and as usual, knew most of the shooters in attendance. A young man joined our squad, whom neither Randy nor I knew….. He introduced himself as Bob Vogel, and asked us if we wouldn’t mind giving him some pointers, as he was new to USPSA and this was his first match. Although, “Bob” was quite young, I was immediately impressed with his maturity, and eagerness to learn. Randy and I were both accommodating, and agreed to share our “wisdom.” Randy being a Master Class shooter was one who usually helped me out, so I thought this would be an opportunity to “give-back,” by supporting this young “rookie.” Well, as the match progressed, it was easy to see that although Bob may have been new to USPSA, he was definitely NOT a “rookie,” as he was highly experienced driving his limited gun. If memory serves, I “barely” beat him with my Open Gun……. I later learned that Bob shot a Master Class Classifier that day…. and he has never looked back. Presently, Bob has won too many state titles to mention, and he is a contender at any National event that he enters. Recently, I asked Bob to train with me. We had both just shot the Indiana State Championships, and we both competed in Production Division. Needless to say, Bob won the division, but the real story is the margin by which he won. He beat the second place finisher, another GM, by 20%, and he beat me (I finished 3rd) by 30 %. Needless to say, I was IMPRESSED! With that said, I had to pick this guy’s brain….. It is ironic that Bob asked for my help that day in 2003, and now, 4 years later, I was seeking his help…. I contacted Bob about getting together. He was very accommodating. We agreed on a date, time and location, and we trained together for more that six hours. Although I have been shooting since 98′, and consider myself somewhat experienced, Bob was able to teach me plenty. I have had some formal training in the past, and was not overly thrilled with the instructor or the results. One of my past classes consisted of the instructor saying: “Watch me do it this way….., you do it the same way.” This process then repeated for the rest of the class. I became convinced that I was funding this instructors practice session! That class did not include any analysis of my individual technique, or include explanations of “why” something was being done(something that I personally need to learn). There was definitely no “thinking things through” with me as a student, in an attempt to find a better way. Anyway, what I DID learn after plunking down my heard earned cash, is that just because someone is a phenomenal shooter, does NOT make them a good teacher! Given my previous experience, I was slightly hesitant about my class with Bob, as I was not quite sure what to expect. Fortunately, my concerns were unfounded. Bob and I had a great training session together, and I shot over 400 rounds. Bob started with the basics and did a baseline check of my fundamentals. Once satisfied that I had a good foundation, Bob quickly assessed my strenghts and weaknesses, and moved on to the areas in need of attention. Bob had me train on: Accuracy drills, multiple targets, some basic classifiers, and then he had me shoot a full blown stage scenario. Bob critiqued and offered me feedback after each drill, and he focused on both hard-side technique, as well as the soft-side mental approach. I needed help with both areas, and the results proved it. By the end of the day, I was consistently shooting classifiers scores much higher than I previously could, and was somewhat surprising myself with my results. During Bob’s class, I did not sit around and watch Bob shoot, as I did with that other instructor. Bob and I both ran through the full-blown practice stage, per my request, so I could breakdown and compare and contrast his approach vs mine, and identify the areas where he was picking-up time on me. By having Bob run the stage too, we were able to try different approaches, and compare different ways of breaking-down the stage, to find the method that would yield the best results. Other than Bob shooting the stage with me, the entire training session was about me, and not a practice session for Bob. I was very impressed with Bob as an instructor, He is mature, patient, knowledgeable, and modest. I would think that a 3 division Grand Master could be a little arrogant, but not Bob. ….Remember that day back in 03′ when he asked for my help? He failed to mention that he was already a Master Class IDPA shooter, and a recently crowned IDPA State Champion. In a sport that can have egos abound, and people wanting to brag about their accomplishments, Bob is an exception, and that’s the type of person that I want to work with. 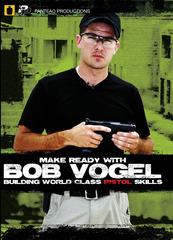 I would recommend Bob Vogel as an instructor without hesitation, based on his ability, instructing capability, and character. 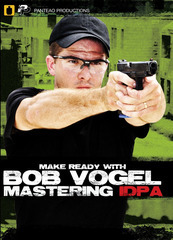 Time spent training with Bob would be a worthwhile investment, to anyone wanting to become a better shooter.